This action arises from the Harwich Planning Boards approval of a definitive plan creating a subdivision of land off Headwaters Drive. The subdivision approval process began in January 2005, when Peter J. Nyberg submitted an application to the Planning Board (Board) for approval of a subdivision for land shown on a plan of land titled Definitive Subdivision Plan of Land in Harwich, MA prepared for P.J. Nyberg, dated January 3, 2005, revised January 26, 2005, and prepared by Ryder & Wilcox, Inc. The plan submitted depicts eleven numbered lots with a cul de sac titled Jilma Way. Defendant James Marceline (Marceline) signed the plan as the owner of the land. [Note 3] After four sessions of a public hearing, on April 26, 2005, the Board approved the plan and its decision was filed with the Town Clerk (Subdivision Plan). The dispute in this matter is based on differing interpretations of the location of one particular road variously referred to in the parties chains of title as Old Brewster Road, Old Brewster  Harwich Road, the road leading from Harwich to Brewster between the ponds, and the road running from Brewster to Harwich (For ease of reference, the court chooses the name Old Brewster Harwich Road when referring to the road that divides the parties properties.) There are deeds in both Allisons and Marcelines chains of title that mention Old Brewster Harwich Road as the easterly boundary of Allisons property and the westerly boundary of Marcelines property. Importantly, prior to trial, the parties agreed that Old Brewster Harwich Road, wherever located, divides their properties, but they disagree on the location of the road. The roads location, therefore, is determinative of the parties conflicting claims of ownership. As shown on Sketch A, there is a road configuration that begins at Queen Anne Road, Harwich, to the south, and travels north to where the road forks, with one tine continuing northwesterly and the other continuing northeasterly. The parties agree on the location of the portion of the road that runs between Queen Anne Road and fork, but disagree on the course Old Brewster Harwich Road takes northerly of the fork. Allison maintains that the road continues in a northeasterly direction and is the easterly of the two roads depicted by the parties. See Sketch A, where Allisons road is labeled Overgrown Vehicle Tracks. Marceline argues Old Brewster Harwich Road runs in a northwesterly direction and is the westerly of the two roads. See Sketch A, where Marcelines road is labeled Old Road Tracks. [Note 6] The divergence of the two roads creates a Y with the disputed area located within the v of the Y and the undisputed portion of Old Brewster Harwich Road comprising the stem of the Y. As shown on Sketch A, the area at issue in this case is bounded northerly by land now or formerly of OLeary and Kozak (within the area sometimes referred to herein as the Crescent), easterly by Overgrown Vehicle Tracks, southwesterly by Old Road Tracks and westerly along a ditch, at land claimed by Allison. If Old Brewster Harwich Road is located as Allison maintains, then Marceline does not have title to a large portion of the land shown on the Subdivision Plan, including all of Lots 2 through 5, most of Lot 1, and portions of Jilma Way, Lot 11, and Lots 6 through 9 (Disputed Area). If, however, Old Brewster Harwich Road is located as Marceline argues then Allison does not have any claim to the Disputed Area or any of the land shown on the Subdivision Plan. In response to Allisons appeal of the Boards approval of the Subdivision Plan, Defendants Nyberg and Marceline asserted counterclaims alleging slander of title and insubstantial and frivolous claims not advanced in good faith. During several years of discovery and pretrial preparation, numerous case management conferences and status conferences were held as well as motions for summary judgment, which were denied in March, 2008. Also prior to trial, this court ruled in limine that it was not bound by the depiction of Old Brewster Road on the A Plan in Registration Case 41818, as Defendants asserted. The court ruled that the registration case expressly did not determine the location of the road in question here. Specifically, during the months leading up to the issuance of a judgment of registration, defendants in that case, including Allisons predecessor-in-interest, expressed concern regarding the depiction of Old Brewster-Harwich Road on the filed plan. Apparently as a result of those concerns, before the defendants withdrew their objections to the registration, all parties executed a stipulation, filed with the court on November 3, 1995, in which the parties agreed, inter alia, [a]lthough the name Old Brewster Road was assigned in the decree as to locus it is in dispute whereby it may not be the same Old Brewster-Harwich Road referred to in abutting claims. To reflect that dispute, the Petitioners filed Plan and the Petitioners Easement Plan were revised to remove the name of Old Brewster-Harwich Road and thereafter labeled it simply as an unnamed road. (Plaintiffs Exhibit 44). All experts filed their direct testimony through affidavits filed on May 22, 2009, approximately two months before trial, with the exception of the Affidavit of Charles N. Rogers, which was filed April 8, 2009. With the benefit of that direct opinion testimony in mind, on July 7, 2009, the court took an extensive view of the Disputed Area and surrounding property in the presence of counsel and the parties experts. At the view the experts pointed out relevant monuments and topographical features which they believed were pertinent to the location of Old Brewster Harwich Road, as set forth in their respective affidavits. [Note 7] At the view, the court was able to see many of the topographical features shown on the Subdivision Plan including Overgrown Vehicle Tracks, and the triangular intersection of ways, as there are remnants of these features located on the ground, as pointed out by the surveyors. It was also possible to see topographical features of a road Plaintiff identifies as the right of way to Philip Ellis house, labeled Path, on the Subdivision Plan, as well as a ditch and swamp wetlands. 1. Freeman Allison, a resident of West Harwich, claims an undivided one-third fee simple interest in the Disputed Area derived by inheritance and conveyance from the interest of one John G. Doane, who was one of three grantees in a Warranty Deed dated January 15, 1869, recorded September 18, 1879, in the Barnstable County Registry of Deeds in Book 138, at Page 543 [Note 10], referred to in this action by the parties as the Source Deed, [Note 11] in which title was assumed by Allisons title expert. [Note 12] The parcel of land in which Allison claims his interest is that portion of parcel 2 described in the Source Deed which remained after the judgment issued in Registration Case 41818. (See Decree Plan, Ps Ex. 3). Allisons Parcel is shown on Ps Exhibit 53/Chalk A. 4. James G. Marceline is an individual residing in Harwich. The chain of title on which Marceline relies commences with a forty acre parcel (Phillip Ellis 40 acre parcel) described in a grant by Phillip Ellis to Josiah Ellis dated April 14, 1830, recorded in Book 4, at Page 169. The deed describes a parcel bisected by a road running north to Brewster. The eastern and western portions which make up the parcel are rectangular, according to deed description. Marcelines record title chain includes through probates and conveyances not repeated here, but is set forth in the pre-filed direct testimony of Mr. OConnell. (Ds Exhibit 125). 5. John D. Hallisey is an individual residing in Orleans. Halliseys title claim commences with the interest of Levi Eldridge in the Source Deed. His immediate predecessor-in-title was Dana W. Eldredge, who conveyed to Hallisey by deed dated March 10, 2005, recorded in Book 19617, at Page 17. 7. The property shown on the Subdivision Plan, including the parcels in which Plaintiff and Hallisey claim their interests, is vacant, unenclosed and unimproved. A preliminary matter was discussed pre-trial on several occasions regarding the parties standing to contest each others claim of record title. Standing is as an issue of subject matter jurisdiction, Ginther v. Commissioner of Ins., 427 Mass. 319 , 322 (1998). Marceline argued that Allison lacks standing to bring this action because Allison does not have title to the Disputed Area due to defects in the chain through which he claims his title. First, Marceline argues, the insolvency action of Phillip Ellis estate in 1853 was invalid, vesting title in Phillip Ellis son, James Ellis, and not in George Marston, assignee of the Estate of Phillip Ellis, whose title eventually devolves to Allison from the one-third interest of John G. Doane. [Note 15] Second, Marceline alleges Allison lacks title to the land he claims because there is an unrecorded deed from the heirs of John G. Doane to Levi Eldredge and Allen S. Joseph conveying out Doanes one-third interest in the Disputed Area, which would mean that Doanes interest could never have devolved to Allison. A dispute involving a common boundary line involves a question of fact to be determined on all the evidence. Hurlbert Rogers Machinery Co., 235 Mass. at 403. Locating Old Brewster Road is not a simple task. Roads in the general location of the Disputed Area have been referred to by various names in the deeds comprising and surrounding Allisons and Marcelines respective title chains. These names include, but are not limited to, Old Brewster Road, Old Brewster-Harwich Road, a road running from Brewster to Harwich, and the road leading from Harwich to Brewster between the ponds. Surveyor Poole alleges that as new roads from Brewster to Harwich were created, the prior existing roads often came to be called Old Brewster Road. Whether or not Pooles theory is correct, and regardless of the reason, the multitude of names used to describe roads in the area of the parties properties adds a layer of complexity to the seemingly simple task of locating Old Brewster Harwich Road. In addition to names changing over time, there were various roads which co-existed contemporaneously running betweens the towns of Brewster and Harwich. Attorney Perry testified there were numerous roads between the two towns in the 19th century and that many deeds refer to a road to Brewster, a Brewster Road, or an old Brewster Road with the locals along each of them using that designation where appropriate. It is against this backdrop that the court was tasked with determining the location of the boundary line between the parties properties by deciding whether the Overgrown Vehicle Tracks or Old Brewster-Harwich Road, both of which are shown on Sketch A, more likely depicts the location of the Old Brewster Road. Based on Pooles testimony concerning his surveying work, which included a field survey of the Disputed Area, an examination of the Disputed Area and adjacent areas for occupation and monuments, a review of the various deeds in Allisons and Marcelines chains of title, research in historical sources and old atlases, and locating various monuments, including ditches, old roads, abutting property owners, and concrete survey markers, as illuminated by this courts observations at the view, and informed by the title testimony of Attorney Perry, the court finds that Pooles Sketch Plans, Plaintiffs Exhibits 30-33, correctly depict the location of the boundary line between the parties properties, which translates to the Overgrown Vehicle Tracks shown on Sketch A and the Subdivision Plan. Pooles placement of Old Brewster Road based on the location of physical monuments and abutter calls, which can function as monuments in the chain of title, Ryan v. Stavros, 348 Mass. 251 , 259 (1964) (land of adjoining proprietors may be monuments), is persuasive. The court finds persuasive Pooles placements of the deeds recorded in 1853, in Book 55, at Page 271, in Book 55, at Page 393; and, in1854, in Book 58, at Page 199. The 1869 Source Deed, recorded in 1879, from which Plaintiffs title derives, builds off of these earlier deeds. The parties surveyors agree on the location of the westerly boundary of Parcel 2 in the Source Deed. The deed in Book 55/ 271 is a deed from George Marston, assignee of Phillip Elliss insolvent estate, to Obed Brooks Jr., and Cyrus Cahoon. The deed in Book 55/ 393, and the deed in Book 58/ 199, describing the same parcel of land, is the easterly abutter to the parcel of land described in Book 55, at Page 271. Book 55, Page 393 is a conveyance from George Marston, assignee of Phillip Elliss insolvent estate, to Henry Eldredge and Book 58, Page 199 is a conveyance of the same parcel from Henry Eldredge to Obed Brooks, Junior, and Cyrus Cahoon. The description contained in Book 55, at Page 271 states its eastern abutter is land sold to Eldridge: [B]eing the homestead on which said Ellis resides and some adjoining woodland and swamp bounded commencing at the northwest corner thereof at the junction of two roads thence running easterly by a road to land this day sold by me to Henry Eldredge, thence Southerly by the land sold to said Eldredge to land of Thomas Allen, Westerly by said Allens land to swamp, through the swamp to woodland supposed of Nehemiah Kelly, formerly of heirs of Judah Chase, thence northerly by said last named lands and the roads to the place of beginning, with the dwelling house and out houses and all other buildings thereon, with a right of way to the same across the land above named conveyed to Henry Eldredge as the same has been used by Phillip Ellis. [A] parcel of cleared and brush lands in said Harwich and is bounded Northerly by a road, Easterly by a road running from Brewster to Harwich, Southerly by land of Thomas Allen and Westerly by land I have this day sold and conveyed to Obed Brooks Jr. and Cyrus Cahoon, by an old ditch around (?). Reserving to said Brooks and Cahoon a right of way across said land, as the same has been used by Phillip Ellis to and from the land conveyed to them aforesaid. (Emphasis added). [A] piece of cleared and young woodland in said Harwich and is bounded Easterly by a road running from Brewster to Harwich, Southerly by land of Thomas Allen, Westerly by lands of said Obed Brooks Jr. and Cyrus Cahoon by an old ditch and Northerly by a road leading from said Brewster-Harwich Road to the Herring River containing nine acres, be the same more or less. (emphasis added). As the land conveyed in Book 55, at Page 271 and in Book 55, at Page 393/Book 58, at Page 199 abut each other, the eastern boundary of Book 55, Page 271 abutting the western boundary of Book 55, Page 393/Book 58, Page 199, the deed call by an old ditch becomes a monument informative to locating these parcels. Pooles placement of these parcels accounts for the northeasterly/southwesterly ditch, but Rowley (testifying for Marceline), places Book 55, at Page 393/Book 58, at Page 199 westerly of Pooles placement where there is no ditch located on the ground. [Note 19] Rowley states that although he did not show the ditch between the two parcels on his survey, there is a northeasterly/southwesterly ditch where Poole places the eastern/western boundary of Book 55, Page 271, and Book 55, Page 393/Book 58, Page 199. While Rowley points to Land Court Registration Plan 41818A as depicting ditches in the approximate location of where he places the division between Book 55, Page 271, and Book 55, Page 393/Book 58, Page 199, there is no ditch shown on that plan running in a north/south direction in the appropriate location. For the reasons stated above, the court finds persuasive Pooles placement of the parcels and his location of Old Brewster Road based on deed descriptions containing monuments and abutter calls. The parties experts also introduced historical evidence to bolster their respective locations of the road and discredit the other surveyors placement. With respect to those types of evidence as well, this court finds Mr. Pooles location of Old Brewster Road more persuasive. The surveyors differ as to whether Allisons depiction of Old Brewster Road existed northerly of a certain pump house, focusing on whether the road ever continued between the ponds to its intersection with what is now Route 124. If such road did not continue between the ponds then it could not have been the road leading from Brewster to Harwich. Poole argues the road extended northerly between the ponds, but was extinguished when the Cape Cod Railroad was laid out in 1863. Therefore, Poole contends, that although the road at one time extended into Brewster, it currently ends at the pump house and thus explains why there is no current evidence of the road north of the pump house. Rowley and Schofield argue that the road Poole is referring to was actually a service path built on top of the dike used only to service the adjacent cranberry bogs. The service path was then enlarged and expanded as the railroad was built over the path. Marceline contends that the 1851 U.S. Coast Survey actually shows Marcelines interpretation of Old Brewster Road running in a north/northwesterly direction around Phillip Ellis homestead and farm (what Poole labels the right of way to Phillip Ellis house), and a service path on the dike (considered Old Brewster Road by Poole.) To support his testimony that Allisons location of Old Brewster Road is a service path on the dike, Schofield testified that such path cannot be a road because of the sharp southerly turn the path makes before intersecting with present day Route 124. If this were a major thoroughfare, he stated, the road would have not turned in that direction. Instead it would have turned northerly or continued straight to intersect with Route 124. However, the 1851 U.S. Coast Survey clearly depicts a road traveling through Hinckleys Pond (i.e. over the dike that separates the pond from the cranberry bog) and then proceeding between the ponds before it intersects with Route 124. A sharp curve is shown on the survey before the intersection with Route 124. Route 124, previously known as Pleasant Lake Avenue, was the major road from Brewster to Harwich at the time of Plaintiffs Source Deed and was laid out in 1846. Poole acknowledged that neither Allisons nor Marcelines Old Brewster roads were considered the major thoroughfares during the period in which the deeds were written, and believes Allisons Old Brewster Road was simply a lesser road from Brewster to Harwich. The deed in Book 5, at Page 214, that mentions a road between the ponds, precedes the layout of Pleasant Lake Avenue in 1846. This indicates that a road existed between the ponds before Route 124 was created and it is possible that Allisons Old Brewster Road was that road. The description of the lay out of Pleasant Lake Avenue also indicates that portions of it pass over an old road, but it is nearly impossible today to determine where that old road was located. See Ps Exhibit 48. Lastly, Poole points to the 1893 U.S. Geological Survey. This survey depicts Allisons placement of Old Brewster Road, but the road ends at Headwaters Drive and does not extend further into Brewster. See Plaintiffs Exhibit 15 (Allisons Old Brewster Road is highlighted in yellow). Rather, a railroad and Pleasant Lake Avenue, present day Route 124, are shown traveling between the ponds. This survey also does not depict a road consistent with Marcelines placement of Old Brewster Road. Despite the lack of continuation of a road between the ponds, Poole claims the 1893 U. S. Geological Survey supports his contention that Allisons Old Brewster Road is the road referred to in Allisons and Marcelines chain of titles because he believes the railroad was constructed over the portion of Old Brewster Road that traveled between the ponds. These documents support Pooles argument that the railroad was built over the existing Old Brewster Road and bolsters his claim that Allisons depiction of Old Brewster Road correctly locates the road. Schofield contends that a road could not have been placed on the dike because the railroad grade rises eight feet from the pump house, located at the southern end of Hinckleys Pond, to Route 124. Without the increase in grade, Schofield alleges, water from the pond would have washed into the area to the southeast of the railroad, the location of the bog, and impacted the road on top of the dike. Poole does not challenge this theory, but instead notes that around 1863, when the railroad was laid out, references to the road which forms the common boundary of the Allison and Marceline titles begin to be prefaced with the word old. [Note 24] Although Schofields argument concerning the grade of the railroad is interesting, the 1851 U.S Coast Survey both show a road beginning southerly of Queen Anne Road, traveling between the ponds. The location of the way that Schofield describes as a service path is more consistent with the continuation of the stretch of road traveling from Harwich to Brewster. The final piece of the puzzle that informs this courts determination of the location of Allisons parcel is what is referred to by the surveyors as the Dunham Parcel. The Dunham Parcel is located south of the Disputed Area and forms part of the southerly boundary of the land conveyed in the Source Deed. The main area of disagreement between the surveyors in determining where to locate the Dunham Parcel arises from the location of the land described in the deed in Book 74, at Page 366 (Allen 1860 Deed), from Thomas Allen to Obed Brooks, Jr., containing two parcels of land. [Note 25] Rowley places the land described in the Allen 1860 Deed as a separate parcel located between the Dunham Parcel to the south and the Source Deed land to the north. Poole, who believes that the Allen 1860 Deed was part of the Source Deed and does not have to be accounted for separately, places the Dunham Parcel as the Source Deeds southerly abutter. This disagreement leads to a difference of 300 feet between Pooles and Rowleys location of the Dunham Parcel. Compare Chalk F, Sheet 4 of 10, Defendants Exhibit 18, with Plaintiffs Exhibits 30-33. Rowley argues Poole ignores deed calls and natural monuments when placing the Dunham Parcel, but Poole convincingly points to the Mid Cape Highway Valuation Plan Y-69-H prepared for the Commonwealth of Massachusetts Department of Public Works dated 1955 (Mid Cap Highway Plan) to support his position. See Ps Exhibit 9. The Mid Cape Highway Plan, which shows several parcels located between Queen Anne Road and the Dunham Parcel, is consistent with Pooles placement of the Dunham Parcel. 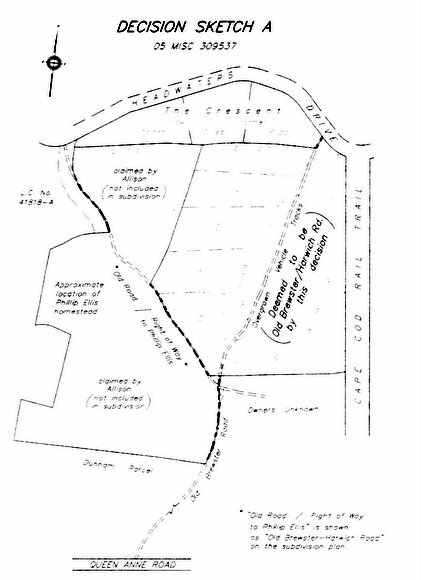 Poole examined the title and testified regarding each of the parcels described in deeds between the Dunham Parcel and Queen Anne Road to confirm his placement. The location of what are referred to as the Coughlan Parcels provides another area of contention. The disagreement over the location of the Coughlan Parcels stems from the surveyors interpretation and reconciliation of calls in several deeds. [Note 28] Rowley states that there are six consecutive parcels that comprise the Coughlan Parcels and each is contiguous in an east-to-west formation. See Chalk F, Sheet 9 of 10, which compares Pooles and Rowleys placement of these parcels. [Note 29] The Coughlans are pursuing registration of the parcels they claim in pending Case No. 98 REG 43261. Both Allison and the Coughlans, are parties to that action, along with others. Except insofar as this court has made findings with respect to the location of Old Brewster Harwich Road and Allisons Property which bind the parties hereto, this court has not otherwise determined the precise location of the Coughlan Parcels. On the credible evidence presented, and applying the governing law, I find and rule that the Old Brewster Harwich Road is shown as Overgrown Vehicle Tracks on Sketch A attached hereto, which adopts the location shown on Sketch Plans A-D, Plaintiffs Exhibits 30-33, prepared by Donald T. Poole to accompany Narrative of Outermost Land Survey, In regarding the land of Freeman Allison, dated October 16, 2006 (Pooles Sketch Plans). As a result, under Count II of Allisons Complaint, Defendant Marceline has no claim of title to the Disputed Area. For the reasons set forth above, the court has not determined the quality of title to the Allison Property, asserted by Allison and Hallisey. [Note 1] John D. Hallisey was added as a party as to Count II only, upon the allowance of his motion to intervene on September 6, 2006. He waived any right to intervene on Count I. He was nominally aligned with Plaintiff Allison at trial, although they were not in agreement on all aspects of the case. [Note 2] This Amended Decision incorporates the substance of this courts Order on Motions to Amend, dated July 27, 2012, in which the court adopted the following changes to the decision issued April 27, 2012: (1) change Old Vehicle Tracks on page seventeen of the Decision, line two, to Overgrown Vehicle Tracks; (2) change the labeling on Sketch A from Old Road Tracks to Old RoadRight of Way to Phillip Ellis; (3) amend the first sentence in numbered paragraph six on page seven to Defendants, Gerald D. Coughlan and Sally A. Coughlan, are individuals living in Yarmouth Port; and (4) eliminate footnote thirteen on page seven; and (5) amend the fourth sentence in the second full paragraph on page eight by deleting the word Defendants and replacing it with the word Defendant. As a result of these changes, some of the spacing and numbering has changed. In addition to the changes set forth above, the court has deleted the final paragraph of the decision, in which the parties were given a timeframe in which to comment on whether the case was ready for judgment, and replaced it with the order that Judgment may issue. No other changes to the original decision have been made. [Note 3] In a stipulation filed with the Court on April 15, 2009, the parties agreed that all claims against Nyberg were dismissed with prejudice, without costs or attorneys fees to any party, and with all rights of appeal waived. Defendant James Marceline was substituted for Nyberg. [Note 4] Allison asserted his claims to this land at the hearings before the Board; however, Marceline also asserted ownership to the same land at the hearing, and the Board proceeded to approve the Subdivision Plan. [Note 5] Mr. Hallisey asserts a claim for at least a one-third undivided interest in the land shown on the Subdivision Plan. [Note 6] The surveyors also vary in their labeling of Old Brewster Harwich Road. Charles Rowley, Marcelines surveyor, titles Allisons version of the location of Old Brewster Harwich Road as an Old Road extending northeasterly from Old Brewster Road, and labels Marcelines version as Old Brewster  Harwich Road (See Land Court Registration Plan 41818A). See Chalk F, Sheets 1, & 3-10. Donald Poole, Allisons surveyor, labels Allisons interpretation of Old Brewster Harwich Road as Brewster  Harwich Road and Marcelines interpretation as Old Road  right of way to Phillip Elliss. See Pooles Sketch Plans A-D, Plaintiffs Exhibits 30-33 (also shown as Chalks B-E). [Note 7] The surveyors included Donald T. Poole for Plaintiff, and David A. Schofield and Charles Rowley for Defendants. [Note 8] The Planning Board of Harwich members, although defendants in this action, did not participate in the trial. [Note 9] The court is also in receipt of Defendant Marcelines Motion to Strike: 1. Sketch Plan on page 8A of Intervenor Halliseys Request for Findings of Fact and Rulings of Law and 2 and Intervenor Halliseys Reply to Defendant James Marcelines Request for Findings of Fact and Rulings of Law  Res Judicata Application of Two Prior Massachusetts Cases to Present Quiet Title Action, filed September 13, 2010. An Opposition was filed September 23, 2010. The court does not rely on Halliseys Sketch Plan nor does it reach the issue of the validity of Allisons, Halliseys, and Marcelines titles. Therefore, the court declines to rule on this motion. [Note 10] All future references to the book and page numbers of deeds refer to deeds recorded at the Barnstable County Registry of Deeds. [Note 12] The two other grantees were Alfred Eldredge and Levi Eldredge. [Note 13] The deed is executed under seal. Even assuming Marceline has standing to challenge Allisons title, which this court finds he does not, Marceline, as the party challenging Allisons status as a BFP, has the burden to prove that Allison was not a BFP. In support of his challenge to Allisons title claim, Marceline alleges that there was an unrecorded deed out of Allisons chain before Allison took title from Robert F. Allison, and therefore Allison took nothing through his chain. However, there was no evidence introduced that established that Allison had any actual knowledge of a title defect or was otherwise not a good faith purchaser. [Note 14] Hallisey and the Coughlans both claim title Levi Eldredge and are adverse to each other in that regard. Neither claim title through Doane. The Coughlans did not assert an interest in the Disputed Area in this action. [Note 15] George Marston acquired Phillip Ellis estate as assignee through Barnstable County Insolvency Case No. 437. See Intervenor Halliseys Exhibit 9. Marston then conveyed a portion of the estate to Obed Brooks, Jr., and Cyrus Cahoon (recorded in Book 55, at Page 271) and another portion of Ellis estate to Henry Eldredge (in Book 55, at Page 393). Henry Eldredge then conveyed the land recorded in Book 55, at Page 393 to Obed Brooks, Jr., and Cyrus Cahoon (in Book 58, at Page 199). The parcels described in Book 55/ Page 271 and in Book 58/ Page 199 comprise a portion of the land conveyed in the Source Deed by the Trustees of the estate of Obed Brooks in 1869. The Source Deed forms the basis of Allisons and Halliseys record title and a portion of Coughlans record title. [Note 16] The title issues regarding may arise in a pending registration case, 98 REG 43261. The registration case was filed by the Coughlans to register and confirm title to eleven parcels of land, involves land in the same vicinity of Harwich as the current case (although the exact location of the land is yet to be determined), and involves some of the parties to this litigation. [Note 17] See Plaintiffs Exhibit 53 and 30-33, Plans A-D.
[Note 18] St. 1893, c. 340 adopted the record title requirement found in G. L. c. 240, § 1. See Bevilacqua v. Rodriguez, 460 Mass. at 769-70. After the enactment of St. 1893, c. 340, the Supreme Judicial Court in Arnold v. Reed, 162 Mass. 438 (1894), held that mere possession of the property, as held by prior case law, was not sufficient to maintan an action to quiet title; record title was also required. Id. at 769-770. [Note 19] See also Chalk F, Sheet 5 of 10; Trial Tr. vol. V, 25-26, Dec. 8, 2009; Trial Tr. vol. V, 157-58, Dec. 8, 2009. [Note 20] See Chalk F, Sheet 1 of 10. [Note 21] The Crescent is a crescent shaped area of land located south of Headwaters Drive, west of where Allison places Old Brewster Road, north of a ditch, and east of where Marceline places Old Brewster Road, depicted on Chalk F, Sheet 1 of 10. [Note 22] See Chalk F, Sheet 1 of 10. [Note 23] See Plaintiffs Exhibit 11; Defendants Exhibits 37-44, 48. [Note 24] This was true as well in 1846, when Pleasant Lake Avenue, currently Route 124, was laid out. [Note 25] There is also a dispute as to whether the deed calls for a total of six or twelve acres. The deed call states, both pieces containing six acres. Poole argues this means a total of six acres while Rowley argues each piece contains six acres. [Note 26] This location is consistent as well with the 1885 deed of Allen S. Joseph, et al to Prince A. Atkins, recorded in Book 330, at Page 475. (Ps Exhibit 7). [Note 27] See Trial Tr. vol. V, 98-100 (Dec. 8, 2009); Trial Tr. vol. VII, 127-129 (Feb. 1, 2010); Trial Tr. vol. III, 165-169 (July 22, 2009). David Schofield was not able to explain the discrepancy between the 1978 Study Sketch prepared by his firm (but not by him) and his testimony at trial with respect to the location of several parcels, including Allisons parcel and the Dunham Parcel. [Note 28] The deeds that describe the Coughlan Parcels are: (1) Book 877, Page 461, Parcels 1 and 3; (2) Book 6041, Page 112; 3) Book 262, Page 35; (4) Book 439, Page 409; (5) Book 358, Page 273; and 6) Book 877, Page 461. [Note 29] Note that Poole does not place two of the westernmost parcels in his sketch. (Ps Exhibit 33.) Rowley adds the two westernmost parcels to his depiction of Pooles sketch on Chalk F, Sheet 9 of 10 to illustrate his point that had Poole located all six parcels they would impinge on the land previously registered by the court. Poole, however, argues that Rowleys assertion is only correct if one accepts Rowleys premise regarding where all six parcels are located, which Poole does not.